The kitchen is one part of a house that set up is not so easy, but its benefits outshine its tasking duty. Stepping up the kitchen is essential not just for beauty but also for winning hearts with the sumptuous meals that are prepared for their stomachs. As much as cooking can be enjoyable, not having the right tools can only make it laborious. Here are lists of tools that can make your cooking less stressful. Utility Knife: This knife has a blade of between 4 to 7 inches designed for slicing and coring vegetables and fruits. Paring Knife: This knife has a short usually made not more than 4 inches. It is designed for cutting vegetables and fruits, with precision. Boning knife: If you are considering breaking down chicken or pork, the boning knife is the right option. This 5 to 7 inched blade is designed with such flexibility, agility, and sharpness to serve you. Bird’s peak Paring knife: Mostly used in cutting round fruits. Bread knife: The bread knife is a serrated knife used in cutting bread loaves without smashing it. A good bread knife can also be used for cutting cakes and pastries. Butcher Knife: The butcher knife comes to play when accuracy is needed in trimming and segmenting larger meats cut. It can also be used for fruits like watermelon and pineapple. Cheese Knife: Designed to cut through every type of cheese, it glides through with such smoothest, and its holes prevent any sticking. Others types of knives are Hardy Slicer, Meat Cleaver, Vegetable Cleaver. The invention of non-stick pots and pans brought a revolution to kitchen wares, and it is fast becoming a must-have in kitchens. Non-stick pots and pans make washing easier and cooking and frying less cumbersome. Some of the best professional frying pans are Tramontane 10-inch non-stick pan, Cuisinart Contour 10-inch hard anodized skillet, All-clad Stainless Tri-Ply skillet non-stick pan. 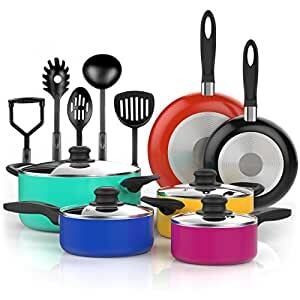 Non-stick pans and pots are good options for your cooking because of the beautiful features they possess which are the even distribution of heat making for faster cooking, affordability, good grip handles, and sturdiness. 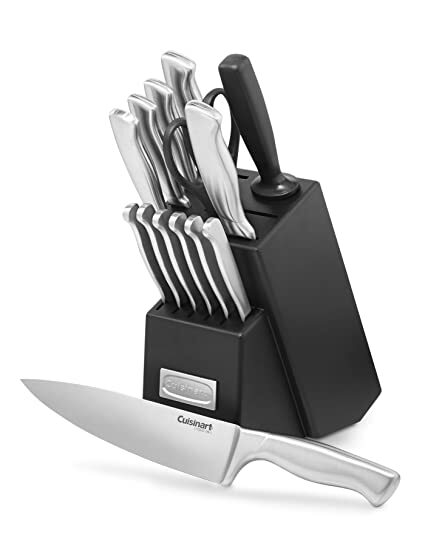 Having a beautiful set of knives with a cutting board is essentially not been equipped for preparing a delicious meal. Cutting board makes cutting, chopping and slicing easier and neater and prevents cross-contamination from kitchen surfaces. There are two types of cutting board; the wooden and the plastic cutting board. While the plastic model is more dishwater safe, the wood type is more durable and more premium. Cooking beef and beans can be time-consuming. Wanting to make your loved ones happy and satisfy their hunger, then pressure cooker should be a standby in the kitchen. It cooks food faster by using pressure created by heat and water in an airtight pot. The trapped steam produces internal pressure and allowing the temperature to rise. After use, the pressure is released by removing the valve making it safe to open. There are various recipes for pressure cooking. The food processor is necessary kitchen equipment. It is similar to the blender but different in that it has several replaceable blades and disc for various tasks while cooking. It can grate, mix the dough and other mixable, grind, mill and also liquidize. With a food processor, your work can be ten times faster and more comfortable. If you need the inspiration to create more dishes, then food processors are your big shoot. Many of the ingredients used for cooking are canned and can be challenging to get around without a can opener. Can openers are essentials for the kitchen if you must prepare a great meal? The baked beans and the corned beef, the sweet peas and others only enhance the need this portable yet invaluable tool. No cooking a can be done without a cooking spoon. The various types of cooking spoons are slotted spoon which is either plastic or metal with slotted holes at the base and are used for stirring serving food made in thing liquids. Solid spoon used for serving thick sauce. Wooden spoon for use in non-stick pots ad these wooden spoons do not do well for serving ladies which have scooped ends and long handles for serving stews and soups. Starting up a kitchen and choosing daily needed tools can be interesting. And when it is tasking you will be glad you did when you are enjoying its benefits in the long run. The good part is that this equipment will not run your pockets. Kithen tools is very important for preparing recipes. Some simple, basic kitchen tools you should have on hand to make prepping even the most complex meals easier, As like coffee frother, Electric Wine Bottle Opener, Kid Knives, Garlic Press, Stainless Steel Scraper and Pastry Cutter etc.